Seven people are in custody after appearing in court, charged with trying to sell the 18-inch shell. 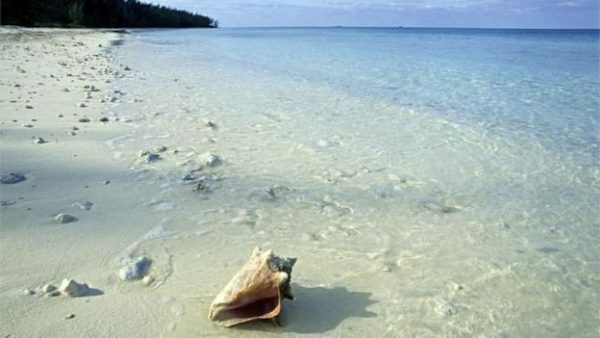 Police say the conch might have fetched $70,000 (£60,000). Its sale is banned under an international convention. It is feared that Sri Lanka is emerging as a hub for the illegal export of rare seashells. 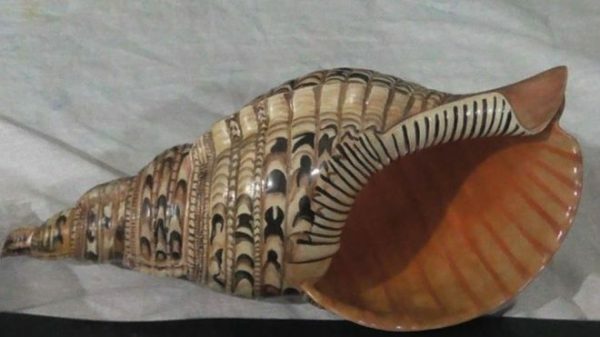 The conch is in the custody of Sri Lanka’s wildlife department. Dr AK Kumaraguru, an expert on marine and coastal studies, told BBC Tamil that “right-twisted conches are extremely rare and could be one in 10 million”. The shells are fished for their commercial value, but are also of huge significance in the Hindu religion, he says. Genetic mutations are cited as an important reason for right-handed shells. Variations in their colour and pattern occur naturally. Pure white right-handed conches are considered very sacred by Hindus and are highly sought after in the Indian Ocean, particularly off south India and Sri Lanka. The illegal trade in sea shells is said to be worth millions of dollars. “There is little data on trade levels both legal and illegal; most available information is based on casual observations, incomplete figures, reports from shell collectors or fishermen and brief studies carried out by scientists,” the CITES (Convention on International Trade in Endangered Species of Wild Fauna and Flora) secretariat in Geneva told the BBC. Seashells are protected by law in Sri Lanka, but marine life experts say that lack of strict implementation has allowed the illegal export trade to thrive.